Cim Smyth arrived in Kotzebue early Easter morning, winning the 2015 Kobuk 440 sled dog race. In the early hours of Easter morning, the first mushers arrived into Kotzebue at the end of the Kobuk 440 sled dog race. The first place title and more than $11,000 purse went to Cim Smyth of Big Lake, who arrived just past 6 o’clock on Sunday morning – after 2 days 18 hours and 4 minutes on the trail. It was a first-time win for Smyth, who says the race was his primary focus this year, after he chose not to run the 2015 Iditarod. Despite a controversial date change that pushed it closer to the finish of the 1000 mile sled dog race, the Kobuk 440 drew a total of twelve mushers this year – competing for an historic $35,000 combined pot. 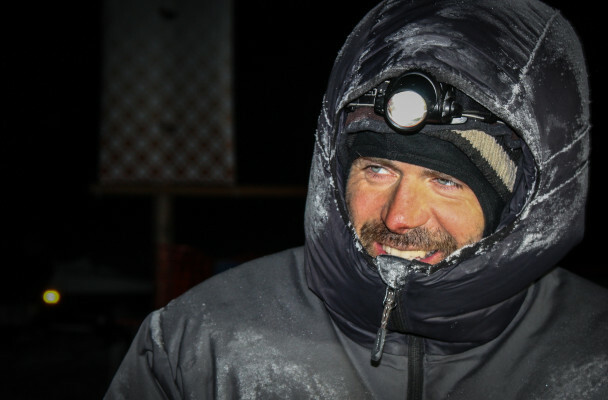 And while several teams had completed the race from Fairbanks to Nome just two weeks earlier, that didn’t keep former Iditarod winner, and defending Kobuk 440 champion, Jeff King from the competition. Smith and King travelled neck-and-neck for much of the race, with King leading from Ambler to the halfway point of Kobuk and back. But Smyth finally passed King on the westbound trail Saturday evening, at a shelter cabin between Ambler and Selawik. The race was close, and tensions appeared to be high as the pair flew through several upriver checkpoints. But at the finish line, both competitors shook hands and congratulated each other on a great race. Smyth even surprised King with an offer to remove booties from his rival’s team. Kotzebue musher John Baker was next to arrive at the finish. He started the race with a strong showing –arriving first into Ambler, and collecting a bevy of local prizes in the process. Baker says another highlight came at the halfway point, where he caught up with cousins and other family members in Kobuk. “That’s the wild side of my family,” he says. Just as Baker was arriving in Kotzebue, the battle for fourth and fifth place had begun. Kristin Bacon and Ken Anderson sprinted, less than a mile apart, across the narrow stretch of Hotham Inlet. Ultimately Bacon emerged victorious, arriving fourth to the finish line in her longest distance race to date. But Bacon says the nearly 500-mile event wasn’t as intimidating as she’d expected. “I had a blast. I mean, I totally lucked out this year. This was stellar,” she says. Bacon was the only woman to run this year’s Kobuk 440, and the only musher to complete the race with a full team of twelve dogs. Tim Pappas, racing a team of dogs from Martin Buser’s Happy Trails kennel, arrived next in sixth place. The race rookie says he was more than pleased with his placement, which he hopes will go toward qualifying for next year’s Iditarod. Mushers continued to arrive throughout the afternoon and night — including Kotzebue locals Andrew Brown, Paul Hanson and Jim Bourquin. As of Monday afternoon, Dempsey Woods Sr. of Ambler was the last musher still on the trail, despite a stormy turn in the weather. Only one musher scratched from the race; Tony Browning says he decided to pack it in after his dogs, many of whom ran the Iditarod with Nome’s Aaron Burmeister, began experiencing health problems near Selawik. Francesca is a reporter at KNOM in Nome.